September 28, Adelaide: Exiled Bhutanese resettled at Adelaide in South Australia celebrated Vijaya Dasami, the most important day of the ten-day long Dasain here today. A small but not too congested community hall at theheart of Adelaide city was full of participants who were seen rushing to take blessing with Tika from the senior members of their community. And, there were seniors from seventy eight year old Bhadra Maya Dhakal to ninety six years old Dhana Pati Poudel who were busy offering tika, chanting hymn and blessing junior members of the community with longevity, prosperity and peace of mind. Around fifty resettled Bhutanese received blessings from seniors who gathered at the hall at 2 PM after having received tika with blessings from the senior members of the family. A team of four priests had been praying goddess Durga since yesterday which is believed to boost the strength of mankind to fight against the evil. Talking to Saranarthi Sarokar (a radio program aired from Kathmandu in Nepal focusing on Bhutanese refugee issue), one of the priests Ganga Ram Bhattarai said, ‘At the initial stage of resettlement I had thought that younger generations would soon forget our rich culture. But, their enthusiastic presence proved that we were wrong in that assumption’. 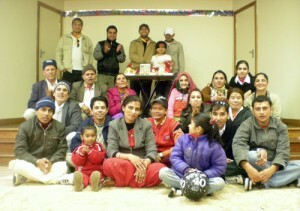 The programme was conducted with the support from Migrant Resource Centre of South Australia. Similarly, resettled Bhutanese at other states of Australia also observed Dasain with joy. At Hobart and Launceston, they had organized various cultural shows to welcome the approaching Dasain earlier. However, the most awaited cultural show will rock Sydney and Albury-Wodonga on October 3 and 4 respectively.